We’d love your help. Let us know what’s wrong with this preview of The Discommodious Wedding by Christopher Kastensmidt. In The Elephant and Macaw Banner series, two brave adventurers--the Dutch explorer Gerard van Oost and Yoruban warrior Oludara--travel the unexplored wilderness of sixteenth-century Brazil. Along the way, the encounter a host of creatures inspired by Brazilian folklore: from the brain-sucking Kalobo to the one-legged prankster Sacy-P Welcome to a world of muskets and magic. In The Elephant and Macaw Banner series, two brave adventurers--the Dutch explorer Gerard van Oost and Yoruban warrior Oludara--travel the unexplored wilderness of sixteenth-century Brazil. Along the way, the encounter a host of creatures inspired by Brazilian folklore: from the brain-sucking Kalobo to the one-legged prankster Sacy-Perey. In this story, The Discommodious Wedding, Oludara and the Tupinamba native Arany wish to marry, but it won’t be as easy as they imagine. Together with Gerard, they must find a way to turn magic against magic and deal with a host of supernatural beings beyond their control. The Elephant and Macaw Banner is an award-winning series of novelettes published in magazines and podcasts around the world. For the first time, this edition unites these stories for English readers. To ask other readers questions about The Discommodious Wedding, please sign up. Another good amazonian adventure of Gerard van Oost and his friend Oludara. I'm still liking the series, but it has hit a certain groove. Gerard and Oludara are forced to deal with some weird monster they never knew about previously. They must overcome it using cleverness rather than overwhelming brute force, and the defeat unlocks the next stage of their lives rather than a simple cash payout. That they operate under the Elephant and Macaw Banner, and are theoretically in this for the money, has not been referenced in two stories, as has all the trappings from the firs I'm still liking the series, but it has hit a certain groove. Gerard and Oludara are forced to deal with some weird monster they never knew about previously. They must overcome it using cleverness rather than overwhelming brute force, and the defeat unlocks the next stage of their lives rather than a simple cash payout. Don't you hate it someone crashes a wedding? But, hey, he brings big cats. The adventures of the Gerard and Oludara continue--this time, they must find a way for Oludara's wedding to take place (which involves--as usual--supernatural hijinks, parlaying and battling). A great muskets-and-sorcery series set in colonial Brazil. The more I read this series the more I love the characters. I specially enjoyed Wildflower in this volume and Yara. Two very different female characters I wish they had their own novellete! Não é só com romances de fantasia épica de quinhentas, oitocentas, mil páginas, que se faz um gênero. Textos mais curtos, como contos e noveletas, estão ganhando novo fôlego com as facilidades do e-book, tanto para quem produz quanto para quem consome literatura. As noveletas de fantasia heroica do americano Christopher Kastensmidt, radicado em Porto Alegre, mostram que nem sempre o romance é o melhor formato para desenvolver uma história, um universo literário. O mundo da série The Elephant and Não é só com romances de fantasia épica de quinhentas, oitocentas, mil páginas, que se faz um gênero. Textos mais curtos, como contos e noveletas, estão ganhando novo fôlego com as facilidades do e-book, tanto para quem produz quanto para quem consome literatura. As noveletas de fantasia heroica do americano Christopher Kastensmidt, radicado em Porto Alegre, mostram que nem sempre o romance é o melhor formato para desenvolver uma história, um universo literário. O mundo da série The Elephant and Macaw Banner (A Bandeira do Elefante e da Arara) é um Brasil fantástico do século XVI, onde as lendas e mitologias formadoras do país ganham vida. Saci Pererê, Boitatá, Curumim, Iara, Labatut, Capelobo e outros. Até agora foram publicadas cinco aventuras da dupla Gerard van Oost e Oludara. O primeiro um holandês que veio ao Brasil em busca de fortuna. O segundo um africano do Ketu (atual Benin), trazido à força como escravo. Ambos selam um pacto de amizade que é o fio condutor da série. É uma amizade improvável, mesmo numa versão fantástica de nossa História. O período colonial foi um dos mais brutais, com pouquíssimo espaço para sutilezas e compreensões de outras culturas. A violência era a lei e o convívio entre europeus, africanos e indígenas era conturbado. Mas, no Brasil criado por Kastensmidt, há gente de muito caráter, a começar pela dupla protagonista. Aqui a gentileza tem uma importância fundamental. É uma mentalidade contemporânea num cenário histórico. Claro que coisas terríveis acontecem, os preconceitos são evidenciados. Porém, por meio da sabedoria de certos personagens, brancos, negros e indígenas, é feita a crítica de comportamentos do passado; e que continuam até hoje. A linha entre o subtexto e o didatismo pode ser tênue. Kastensmidt acerta mais do que derrapa. E estas noveletas são divertidas, afinal? Sim. São textos fluidos, cheios de ação, com boas doses de humor. O autor mostra o esforço de suas pesquisas sobre as culturas e lugares do período com descrições ricas e dinâmicas, geralmente fugindo dos clichês, sem nunca atrapalhar o ritmo da narrativa e o desenrolar da trama. São histórias curtas, em que nenhuma página pode ser desperdiçada. Há um competente desenvolvimento de personagens, principais, secundários e terciários, inclusive os vilões, com motivações convincentes e personalidades tridimensionais. A estrutura do texto tem montagem cinematográfica com cortes que avançam a trama e perspectivas paralelas. Outro acerto é praticamente concentrar os pontos de vista em Gerard e Oludara, o que dá mais foco e densidade ao que é mostrado. As noveletas podem ser lidas em qualquer ordem. Possuem tramas fechadas, que não deixam o leitor perdido no meio desse universo. Mas recomendo que as aventuras sejam lidas conforme a ordem de publicação. É a melhor maneira de perceber a evolução desse mundo, das trajetórias dos protagonistas e da escrita do autor. As edições em e-books são simples, mas muito caprichadas. A começar pelas capas belíssimas, com ilustrações que fazem referência ao tema de cada aventura, finalizadas com uma titulação marcante. I heard about this series of novelettes on the Unreliable Narrator podcast and was intrigued. I was able to download the first 5 works in the series and had burned through ALL of them, plus pre-ordered the sixth book in a single day. Christopher Kastensmidt has provided US readers with a remarkable view into the history of Brazil during the Age of Exploration (Exploitation?) by Europeans. 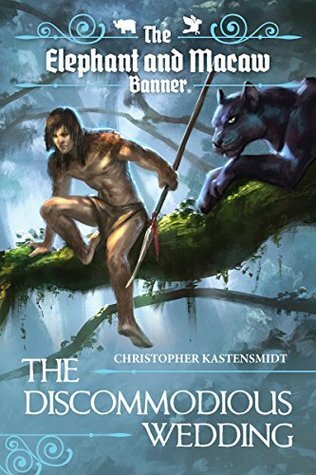 I consider myself to be well-read on the mythology and legends of various cultures, but Kastensmidt schooled I heard about this series of novelettes on the Unreliable Narrator podcast and was intrigued. I was able to download the first 5 works in the series and had burned through ALL of them, plus pre-ordered the sixth book in a single day. The pace is brisk and gets right into the thick of things. Our protags, an unlikely duo, are introduced and propelled into action. The dialogue, the background, the research and the setting all merge into a seamless, compelling read. This is adventure fiction at its finest. And after reading all five books, I have to point out his remarkable use of a consistent framing device to set up and close each novelette - a non-human POV observer to get things moving and to close out the tale. Just really great and well-done. While each of the novelettes could stand on its own, I'd suggest reading in chronological order for the sake of consistency. If you're interested in reading some fine adventure fiction in a setting you've never read before, grab these novelettes and enjoy. Oludara takes a bride...or rather, tries to! This third episode of the adventures of Gerard and Oludara is just as good as the first two. This time we meet three more of the local magical beings, one helpful, the others...not. Kastensmidt paints vivid word pictures of the native residents of Brazil, both human and animal, as well as depicting their beliefs. I very much enjoy his stories! Christopher Kastensmidt was born in Texas but has lived in Porto Alegre, Brazil since 2001. Christopher was a Nebula Award finalist and winner of the Realms of Fantasy Readers' Choice Awards for his novelette "The Fortuitous Meeting of Gerard van Oost and Oludara." This story was the first in The Elephant and Macaw Banner fantasy series, which has since been published in six countries and adapted t Christopher Kastensmidt was born in Texas but has lived in Porto Alegre, Brazil since 2001. Christopher was a Nebula Award finalist and winner of the Realms of Fantasy Readers' Choice Awards for his novelette "The Fortuitous Meeting of Gerard van Oost and Oludara." This story was the first in The Elephant and Macaw Banner fantasy series, which has since been published in six countries and adapted to comics and games. These stories feature a Dutch explorer and Yoruban slave who meet in sixteenth-century Brazil and begin a series of adventures together, harkening to old Sword & Sorcery heroes like Fritz Leiber´s Fafhrd and the Gray Mouser and Charles R. Saunder's Imaro. Christopher ran Brazilian video game developer Southlogic Studios for a decade before its sale to Ubisoft Brazil, where he served as Creative Director. He participated in the production of thirty internationally-published video games, totalling millions of units sold. Christopher has a Bachelor's degree in Electrical and Computer Engineering from Rice University and a Master's degree in Social Communication from the Pontificia Universidade Catolica do Rio Grande do Sul. Besides writing, he lectures at UniRitter university on scriptwriting, game designm and video game production.